"Thar She Blows!!". W115 blow-by video. That dumps oil directly into the air intake, which adds to smoking but not blow by. I've had that problem on my 240D. Put a new diaphragm in the pump and the smoking went away. Yes, not blowby, but oil consumption. Still a good idea to fix for sure. Despite a new oil cap gasket, it still makes that oily mess on the valve cover gasket and oil works its way onto the top of the air cleaner too. Do you have the plastic cap? I put 2 gaskets in the cap- worked for a while, but did not fix it. Got a new cap (it was plastic) from the dealer- again, short term fix. Finally got a used metal cap on ebay, and it has been absolutely spanking clean since then! I love this forum. That is great information... I have to run to a meeting presently, but I may have more to add later. I have had suspicions about that vacuum line... and it is relatively new. I am going to take another look at it in the next few days. Here's Tom shutting off his car at ChowdaQ 2009. I didn't bring my camera last year so didn't snap a repeat pic. That'd be a cheap thing to fix before re-evaluating oil consumption. It'd also be worth running/parking over cardboard to determine if you've got some hard to spot leak thats causing some of the consumption. If it were me I'd have the head redone. I think you're probably going to want that no matter what. The 115 617 engine is relatively rare since they were only 2 years, I don't know if you can use a later 617 block or not. That would be a relatively easy answer if you could but never the less a known good head would be a nice place to start no matter what. Back to the ruptured vacuum pump diaphragm, I had that happen on my 240D and it manifested as a big oil leak down the right side of the engine and traced to the air cleaner housing, which was full of oil that the vacuum pump had pumped in. Is it routed differently on a W115? This was all part of my brilliantly diabolical plan to capture the ChowdahQ Jalopy Award from the reigning previous winner.... which was.... You guessed it: Curt! Yes I have a spare shut off valve for the injection pump.... Just haven't gotten around to doing it. For the past.... Er..... 6 or 7 years. . It is on my list for this project though. Unfortunately, that means you may not get any more pics like this one, Curt. I want to do the leak down test. If need be I will either redo this head, or redo the spare cylinder head I have from my dear departed 1976 rust bucket. RIP. I just rechecked that vacuum line, in the light of our earlier conversation. It appears clean. The dark area seen in the video may have been caused by the lighting. That line broke about two years ago, and I replaced it. I took several more pics of it....so you can see it is pretty clear... And if I can figure a way to post them from this iPad (not bloody likely, btw) I will. Otherwise I will do it from my computer at work. It is probably worth noting that the old line did show evidence of oil when it broke... So I wouldn't be surprised to find some in the new one.... But it doesn't appear to be there now. I do have some oil showing on the intake manifold.... I think it is coming from the breather hose that goes to the valve cover.... Probably blow-by, I'm thinking. I have the air cleaner housing that resides down low behind the passenger headlight, not up on the manifold. I should inspect that.... Haven't done that in a while. Curt's pic (above) was just a tease. I KNOW you want more. So, here is the whole technically complex procedure involved in manually shutting down the OM617 Mercedes Diesel engine, complete with voice-over narrration explaining this complicated procedure in great detail. No Mercedes diesels were injured in the making of this video. WARNING: I am a quasi-professional (Half-Fast Mechanic). Do NOT try this at home! Here is a pic of the oil on the intake manifold... it appears to be coming from the breather hose that goes to the valve cover. Here are the pics of the vacuum line... the line appears a little dark in places, but there is no evidence of oil in the line... just shadows from the lighting, as far as I can tell. 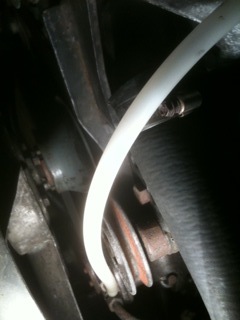 There is definitely oil residue around the breather hose, however, where it attaches to the manifold. For the breather hose from the valve cover to the intake, just put a hose clamp on the intake side, and you'll stop getting oil all over the intake. It will just go into the manifold instead. My 240 was doing this a while back. 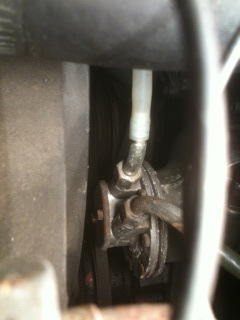 A hose clamp kept the oil in the engine rather than on the engine. I'm just wondering if you could change the results of an emissions test by letting it all flow out the top of the oil cap! Yes, if you have enough oil blowing through the breather. This is exactly why MB put the oil separator in the air filter housing on the later 123s.